Non-hunters may not pay attention to hunting season opening weekends, or the exact boundaries of hunting regions. But if you’re a dog owner in a woodland or upland hunting area, it’s critical to educate yourself about hunting dates to keep your best friend safe. Generally, hunting seasons occur in spring and fall, but the dates can vary widely based upon region. Every state and US territory has a US Fish and Wildlife Service office that provides the public information on local hunting seasons, regulations, and boundaries. Each state also has its own department that oversees hunting regulations and provides detailed information about hunting season. These offices will have varied names, but searching for titles such as ‘fish and game,’ ‘environmental preservation,’ ‘natural resources,’ and ‘wildlife resources’ will point you in the right direction. Be aware that hunting regulations, seasons, and boundaries are subject to change. For example, elk season in Washington state shifts annually based on elk population size and location. Also, hunting on Sundays during the season is completely banned in a handful of states, allowed on private land on Sundays in some states, and allowed on public and private lands on Sundays in still others. If you love hiking with your dog year-round, knowing the hunting zones and times will help you take the precautions outlined below, when and where they are most crucial. Opening weekend of any hunting season is usually the busiest, so it’s a good time for you and your dog to explore the neighborhood streets around your home rather than hiking in the woods or trekking far off the sidewalks over hill and dale. The same goes for dawn and dusk during hunting season, which is prime time for upland hunters and big-game hunters alike. To minimize safety concerns during hunting season, opt to hike with your dog in parks and nature preserves where the sport is not allowed. Small community parks generally won’t allow hunting, but larger public lands, such as National Forests, usually do. Though many parks managed by the US National Park Service allow hunting in order to control animal populations, most of the major parks and many smaller areas do not allow hunting. Explore listings of local, state, and national parks, forests, and wildlife preserves to find nearby dog-friendly parks that are hunting-free zones. You may find yourself looking forward to visiting parks further afield than your usual treks when hunting season arrives. Hunters take precautions, including always double checking the area around their quarry, and keeping their sights set only on their target. Hunters also wear ‘blaze’—brightly colored vests and clothing designed to draw attention to themselves so they aren’t mistaken for game by other hunters. 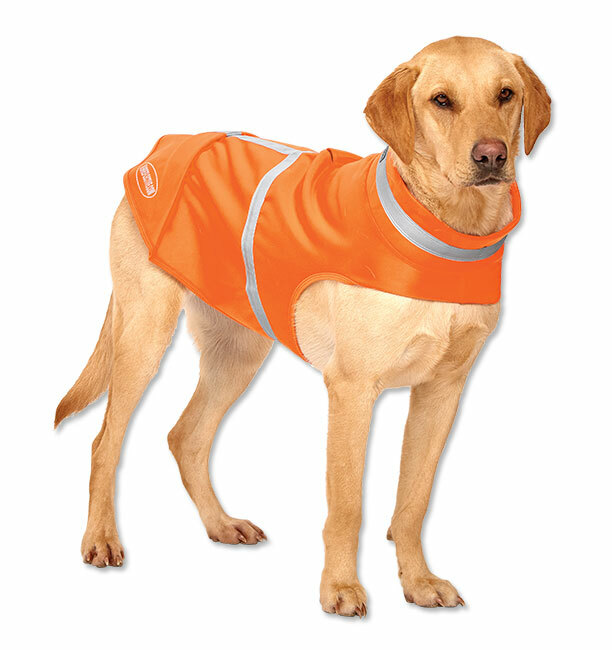 For the same reason, they also put brightly colored vests on their sporting dogs. Vibrant orange is the traditional blaze hue for the eye-catching protective clothing, but it also comes in other neon colors, such as yellow, pink, and blue. If you hike with your dog during hunting season, invest in a bright-colored vest or dog jacket so she stands out against the trees and underbrush. For those who hike at dawn and dusk, it’s wise to add reflective collars, harnesses, and leashes to your dog’s safety wear because they make your dog more visible in low light. Finally, make some noise when you’re hiking with your dog—hiking in pensive silence is best left for after hunting season. If you are on the trail with chatty hiking buddies, your conversation and laughter will help draw attention to your presence. If you’re with a quiet crowd or alone, affix a locator bell to your dog’s collar—it’ll jingle with every step she takes. These dog collar bells are designed to help hikers and hunters keep track of their dogs when off-leash. But in hunting season, they are an excellent way to ensure hunters in your area know you are nearby. Obedience training is always an important component of responsible dog ownership. And, no matter where you live, recall is the most important command for her safety. Simply put, recall is teaching your dog or puppy to come immediately and without fail each time you call. For suburban or city dwelling dogs, the recall command prevents a dog from running into traffic. In hunting territory, it stops your dog from running through the woods or fields during seasons when she may encounter a hunter. The recall command is usually “here” or “come,” followed by your dog’s name. You may think you don’t need to worry much about recall because you have a secure back yard or you never walk your dog off leash, but accidents are always possible. This is a ‘better safe than sorry’ situation. Once you’ve trained your dog to come, know that retraining is sometimes necessary, especially if you don’t use the recall command very often. It’s wise to test and reinforce your dog’s recall training before hunting season every year. If your dog is a recall champion, hiking with her off leash is a unique pleasure and a rare freedom for your adventurous furry friend. But it’s not advisable during hunting season. As highlighted above, there’s always the slim possibility a far-off scent or sound proves too tempting to ignore. Always keep your dog on leash and close by your side during hunting season, so you know she’s safe at all times. You’ve checked and double-checked your backyard fence to ensure your dog can’t break out by digging, squeezing, or leaping. But your dog is a resourceful, tenacious gal and will find a way out if left alone in the yard for too long. Dogs get bored and seek out adventure, just like people. During hunting season, supervise all backyard time that extends beyond the few minutes your dog takes to relieve herself. It’s a great time for you to get some fresh air or take care of yard work. Hanging out together in the yard is also a perfect opportunity to make sure she gets the exercise she needs by playing games of fetch or hide and seek. Remember, hunters keep safety front of mind and their goals overlap with yours when they set off into the woods or the field. Beyond a successful hunt, they want to feel the breeze and get close to nature. They also understand the wilderness is for sharing. So, there’s no need to stick close to the homestead throughout hunting season. With the above safety knowledge and measures in place, the great outdoors can be a worry-free zone in spring and fall when you head outside with your best friend.